I didn't know if I read that line correctly. President Ronald Reagan's attempted assasin of 1981, is getting the Presidential Medal of Freedom? What? He doesn't have one to honor Sirhan Sirhan, Lee Harvey Oswald, and perhaps John Wilkes Booth? Jeff Frank, how's reading comprehension working out for you? Let's just give a medal to Charlie Manson also...he's nuts too. They were listing Hinkley's birthday. A veteran is someone who, at one point in their life, wrote a check made payable to 'The United States of America' for an amount of 'up to and including my life'. That is exactly what 'myweekends' wrote in the article above. Evocative, isn't it....and so true. What hand do YOU use, splasher6? And M.O. did no such thing. I'm curious about something. Here in Utah, on Memorial Day the tradition is to decorate all graves, not just those of service members. A friend of mine originally from Ohio found that to be so unusual that she declared it "A Utah Thing." Is it? We do that at the cemetary my son is buried...we always use Memorial Day to visit and clean-up our family's sites. Memorial Day for our area didn't just mean veterans; it meant everyone who has passed. I don't live in Utah, either. 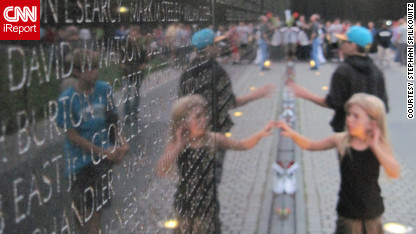 Memorial Day is a Federal holiday meant to honor military men and women who have died while serving their country, most of them of course during a war or conflict. Over the years it seems it's true meaning has changed and many people now use it to honor and remember their own. Now I'm curious: •is• it just a Utah thing? My step dad places flowers on my moms grave on Memorial weekend as well. I think a lot of people do it to honor their loved ones because they don't have a military man in the family to honor. I know my family doesn't. It's a nice gesture but it is suppose to be for the people who died serving our country. Thanks Rox. You posting that does honor to my heart, and the memories of my, OUR, fallen brothers and sisters. You are right, both ways, and i truly want to thank you for remembering the fallen service members first, but not only. THANK YOU !!!!!! And let’s not forget their victims – the brave people fighting on the other side…and the “innocent” ones who weren’t fighting, just existing in the wrong place at the wrong time. The people our troops killed are open wounds, bleeding holes in our flag, and there are millions. But of all of war’s many victims, maybe the ones we should remember most are the victims of 9/11. Those thousands of souls snuffed out on 9/11 are still screaming at us from the other world, screaming out for truth and justice. A black man is president , get over it already.